The Morse Brothers (M/B) Jaw Crushers are rugged, heavy duty single toggle jaw crushers for either laboratory use, or continuous small scale production use. The jaw may be adjusted to produce product down to 1/4”, by simple hand wheel adjustment. The jaw and cheek plates are made of heat treated 4140 alloy steel, which has a Brinnell hardness of 460. The jaw plates are corrugated, and reversible, which tend to grab the material and prevent ‘floating’ of the material in the jaw opening. The overhead action provided by the carefully machined eccentric shaft produces a horizontal and downward movement to crush the material, and facilitate choke feeding as well. The M/B Jaw Crushers are equipped with heavy duty replaceable bronze bearing inserts in the pitman and the main frame. These rugged jaw crushers are constructed with a heavy cast alloy iron frame and all parts are carefully machined for durability and accurate fit. The jaw crushers are shipped, mounted on a tubular steel base and are furnished with TEFC motors, belt and fly wheel guards and feed hopper. Crushing rates will vary with the hardness and size distribution of the feed, however a capacity range is provided below for the M/B Jaw Crushers. 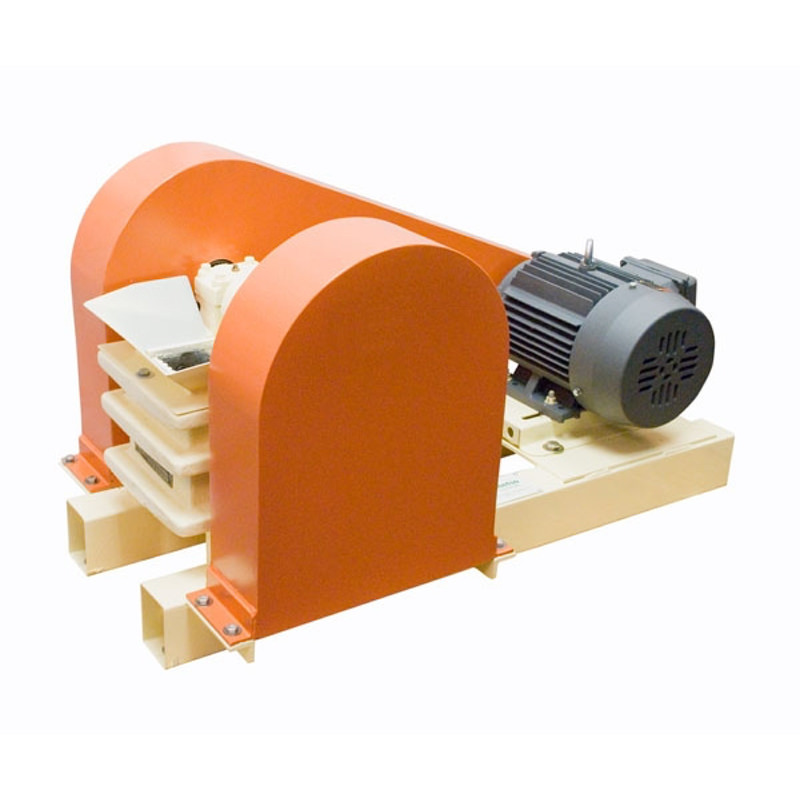 Crushers are available for 230-460 V/3 Ph/60 Hz, 380 V/3 Ph/50 Hz or 575 V/3 Ph/60 Hz operation.